Emily Wurramara is an Australian singer and songwriter.In 2016 Groote Eylandt via Brisbane singer-songwriter Emily Wurramara released her debut EP Black Smoke. Stories from her heart and childhood sung in both English and her traditional language Anindilyakwa, the EP stunned listeners across the country and saw Emily tour nationally and internationally. Black Smoke amassed over 1 million Spotify streams, 25K Shazams, 54K YouTube views, rotation on JJJ and ABC Local x 2, 10 weeks in the AMRAP charts, a Queensland Music Award, a publishing contract with Mushroom and live showcase slots everywhere from BIGSOUND as a Triple J Unearthed feature artist to Folk Alliance International in the USA. 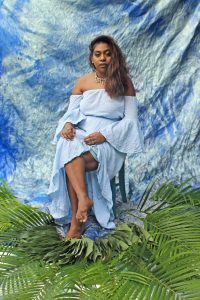 Now, only two years on – with a child of her own and a world of wisdom at her feet, Emily Wurramara has officially announced the long-awaited release of her debut album ‘Milyakburra’.